We apologise upfront for sounding so useless. But this is YOUR operation, not ours and as such unless you have tons of cash to spend on us spending the hours to answer the questions as they pertain to YOU, our answers are only speculation and we don’t do speculation very well. Is aquaculture suitable for small scale rural development? No. Aquaculture is simply not the poster child for small scale agricultural poverty alleviation projects using RAS. It IS suitable for large scale development in rural areas allowing product creation to allow value add and processing to create jobs. You will need R200m+ and in this case you need to talk to Rydawi Services. What price can I sell my fish for? Good question. Until you know your actual cost of production you have no idea what you NEED to sell your fish for. Aside from the cost of feed and power which are more or less known, every other cost is so variable from situation to situation, that to ask us what your selling price should be is pointless. Even better question. Until you know your actual cost of production you have no idea what you NEED to sell your fish for. Aside from the cost of feed and power which are more or less known, every other cost is so variable from situation to situation, that to ask us your return on investment is likely to be is pointless. We will add that this is an economies of scale business, and like any other agricultural endeavour, ROI improves the bigger you get. Tough question. It is where you need to find it. 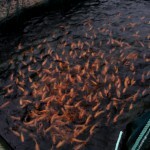 Your fish farm success depends on squeezing every cent you can from your selling price. What we can say about the market is that until you are producing several hundred tons of fish per year, you can and will find niche markets prepared to pay you what you ask for your fish – the current production levels are so low as to be meaningless. At the moment that with a little E for Effort, you can pretty much name your price and this is likely to be the case for several decades. We know it lands at $1.50 per kg or less (less than what it will cost you to feed your own fish), frozen whole from China. With a 20% glaze (ice coating to ‘protect’ the fish). This is mystery tilapia. It’s origins are unknown and untraceable. You have no idea how it was farmed or by whom. You have no idea of when it was harvested or what it was fed. All you know is that it is a frozen whole tilapia. You are NOT competing with this product. If you try, you will lose. You ARE producing a premium quality protein that is anti-biotic, hormone, steroid, GMO and chemical free under ideal controlled conditions. The result is a product that is as high a quality protein source as anything else available for consumption today. 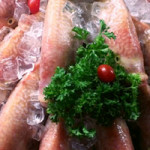 It is even arguably better than wild caught fish since exposure to the environment is well known. Tilapai too, owing to their vegeterian nature are sustainably nett fish positive (i.e. 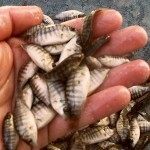 they produce more fish weight than they consume) making them super green. 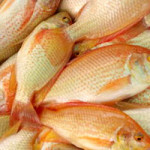 Your tilapia are fresh, premium quality fish and your price must reflect that. Production volumes will never, in the next 20 years, reach market satiation. Imported quality tilapia of a similar standard as yours will land for similar cost that you can sell yours for. However, it will always be frozen and at least a few months older than yours. So yes, what about imported tilapia? Compare apples with apples. What is my payback period? We have no idea. On a single APU system, likely, never, if you factor labour rates into the production costs. Aquaculture is a scale business – you cannot invest small money and expect a small return. That’s the simple reality. To make a business of substance sufficient to wash it’s face and payback the money you will need to scale to an investment level of between R5M and R10M. Plugging your retirement fund into a fish farm is about the most foolish thing you can do, so don’t do it. Rather find the investment (and you will find it) once YOU are invest-able with a proven working model to support your business plan. As it happens it is often easier to find R10M than to find R1M. What about this aquaponics thing? 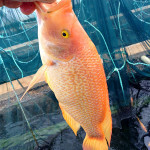 Combining a complicated sophisticated environment of aquaculture which requires specific conditions to be fully optimised with another complicated sophisticated environment of hydropronics which requires DIFFERENT specific conditions to be fully optimised seems to us to be an ‘ambitious but rubbish’ undertaking best left to someone else to prove at a commercially viable scale locally first. Once they have managed it, then copy that. The allure of free filtration and free plant fertiliser is a strong one, but like the perpetual motion machine it can be quite hard to prove in practice. In our experience optimum fish production conditions are sacrificed at the altar of vegetable production. Fish income is then reduced to that of ‘jam on the bread’ but still requires all the expertise of aquaculture to get it right, with the addition of all the complications of aquaponics. In our opinion the way forward is to farm fish properly in an aquaculture system dedicated to the cause. 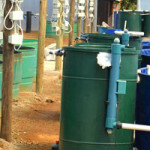 Feed the waste water from this into a separate hydroponics system, dedicated to the cause, and do that properly. We would suggest that you do the trade off study of using this waste water in hydroponics as opposed to conventional irrigation. Can I grow as I go? Without doubt yes. It is a painful process growing in fits and starts, but it can be done and is the way the chicken industry grew. Doing it yourself means you own it yourself and you are building an asset of value. Growth means additional skill and experience will come into the business naturally and eventually you will become extraneous, meaning you can hand the farm to your children or sell it for wads of cash. What is this value chain I hear about? It’s perfectly obvious, AFTER you have started. You’re on your own. There is no one who will process your fish for you. No-one will harvest them for you. No-one will sell them for you (and if they do they’re going to be making the margin that you should be). Your sole outsourced components on the journey from egg to plate are the fry and feed that you can buy in. The rest is landed in your lap to deal with. Yes, you do. However, to get the best out of it, get an APU first. Once you have run that for a few weeks or months without knowing what you are doing, you will have a massive head start in getting the most you can from training. Trust us. Been there, done that. This is good, free advice. Order an APU. It takes us 4 to 6 weeks to assemble the thing for you. It will set you back R30k ex VAT for the standard unit, and R32.5k ex VAT for the unit with a bigger more reliable blower on it (recommended). Once you collect it, it is as simple as setting it up yourself which is just about idiot proof (heck, if we can do it… anyone can!). Should take you about half an hour. Fill with water, add fish, start to feed and your learning and production processes will have begun. A test kit is useful to establish water quality. A net or two to catch fish with. A scale to weigh fish and fish feed. Paper and pen, or Excel, to record ALL your daily data. This is what makes you invest-able. Keep it all, good AND bad. A backup generator / UPS to drive airpumps /blower in the event of power failure. An auto feeder. Only once you have hand fed your fish for a full production cycle. You need to learn behaviour and response first. Location dependent, some means of environmental control – preferably an insulated room, maybe greenhouse. Start to think about how to keep water warm for free. Grit. Plenty of grit. Definition 2.2 below is the one applicable! small loose particles of stone or sand. (with numeral) indicating the grade of fineness of an abrasive.